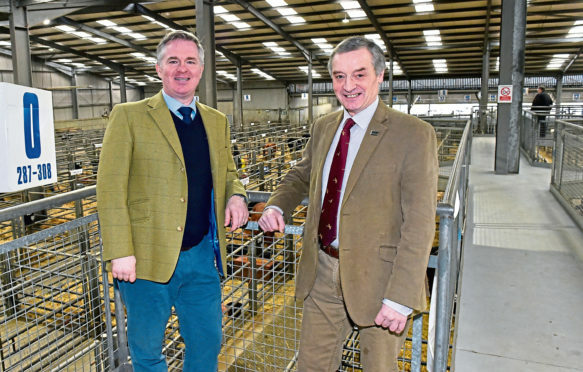 Colin Clark MP (left) and NFU's Charlie Adam. Farmers need to “push back” against negative comments about the industry made by vegetarians and vegans. That was the message delivered by Gordon MP Colin Clark at a lunch for pig producers at the Aberdeen Christmas Classic at Thainstone. The Tory MP said there was scope to grow the domestic market for pork. He added: “The pig industry produces 1.7 million tonnes of meat but we are only 54% self-sufficient – there’s an opportunity there. “It’s a big problem that we are in the news too often for the wrong reason. “The stuff that vegans and vegetarians are saying is often fake news.